The relaxing aroma of this essential oil, sometimes described as like 'apples and straw' is an exotic and rich scent. Roman Chamomile is commonly accepted as the best smelling of the Chamomiles. This is a low growing perennial that rarely exceeds 30cm. The plant is extensively grown in central and Eastern Europe. Leaves are lacy and finely divided on stems capped with small, white daisy-like flowers. Chamomile is an annual native of Europe and Western Asia, growing from one to two feet high. 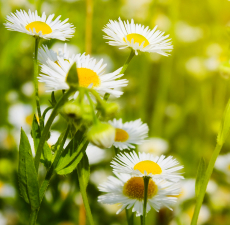 The word Chamomile is derived from Greek roots, -chamos and melos or Ground Apple, referring to the fact that the plant grows low to the ground, and the fresh blooms have a pleasing apple-scent. Over the centuries, Chamomile gained a reputation as an herb of many uses. It is said to have been one of the herbs of choice of Asclepiades, a physician who lived in Bithynia around 90 BCE. Pliny the Elder, one of the most famous of Roman naturalists who wrote extensively on herb use, is said to have given over his medical care to Asclepiades because he was very skillful in prescribing herbs. Non-toxic and non-irritant. It should be avoided during pregnancy. Also, this oil should not be used by anyone who has an allergy to ragweed.